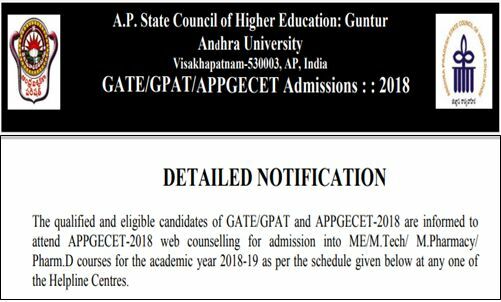 AP PGECET Counselling Dates 2018: Andhra Pradesh Post Graduate Engineering Common Entrance Test 2018 Counselling schedule, Certificate verification & web Option Entry (Computer Online Entry) dates are Announced at appgecet.nic.in. The qualified and eligible candidates of GATE/GPAT and APPGECET-2018 are informed to attend APPGECET-2018 web counselling for admission into ME/M.Tech/ M.Pharmacy/ Pharm.D courses for the academic year 2018-19 as per the schedule given below at any one of the Helpline Centres. Candidates are informed that they should satisfy the admission rules prescribed in the related G.O. besides satisfying the eligibility criteria of the respective universities and should be prepared to pay the tuition fee as applicable. The left over seats after allotment for GATE / GPAT Candidates are only available for APPGECET-2018 candidates. Candidates have to pay a non-refundable processing fee of Rs.1000/- for OC/BC and Rs.500/for SC/ST candidates before he/she attends certificate verification. Processing fee shall be paid online using credit card/debit card/net banking options. Enter GATE/GPAT/APPGECET-2018 Hall Ticket number and rank and click on pay fee online. Select any one mode of payment credit card/debit card/net banking and enter credentials. Once the transaction is successful, note the transaction ID and inform at the time of attending certificate verification. PH Category: Candidates have to produce a certificate issued by the District Medical Board and only candidates who have disability of 40% and above are eligible. Serving persons have to produce Service Certificates from the place of work indicating the relationship with the Candidate. Only candidates whose parents are domicile of Telangana and AP are eligible to considered under “CAP” Category. NCC Category: Candidates have to produce concerned certificates along with A, B, C Certificate(s). Note: The decision of the authorities of NCC/CAP/Ph/Sports is final with regards to priorities fixed and convener as no roll with the priorities assigned. Residence Certificate for preceding 7 years from the qualifying examination i.e, Graduation in respect of candidates who have private study without any institutionalized education (Aadhar card/House hold card). GATE/GPAT Candidates seeking admission into M.E./M.Tech/M.Pharm/Pharma. D (PB) colleges are requested to note the following Fee Types applicable to various courses while exercising options. GATE/GPAT candidates are NOT ELIGIBLE for Reimbursement of Tuition Fee by the State Government. Hope you attended the counselling at specified date. If we are not able to attend the 1st counselling,can we attend for 2nd councellng?plz reply …. Please tell me the certificate verification date for ApPgecet-Chemical students?